Supplementary material reads: "Sandusky. Illus. 'Bermuda Shorts' made their debut on the Sunset Strip last night, and upset the normal dignity which prevails at the Mocambo. The 94 degree heat prompted Joseph Ryan, 30 yr old beauty shop operator, who recently returned from Florida, to break out a pair of the abbreviated trousers he acquired there. Ryan, of 8405 W. 3rd St., LA, while dancing with Miss Lucille Styles, suddenly found Paul Herbert, Mocambo bandleader, joining in the new style by rolling up his trousers above his knees. 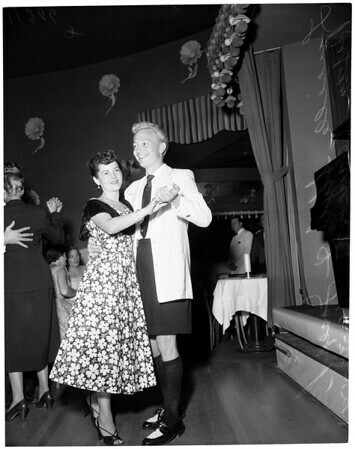 Next to join in the fun was Al Ritz, one of the Ritz brothers, enjoying a dance with Miss Beverly Burman, who thought the shortened trousers looked cool, and rolled up his too".